Orkney, Scotland. Day 25, 23rd July. After Earl Haakon Paulsson murdered Earl Magnus Erlendsson in 1116 (see previous post), his conscience was troubled and he may have thought his passage to Heaven threatened. Consequently, he went on a pilgrimage to Jerusalem. When he came back he built the round church of Orphir which is thought to be based on the Holy Sepulchure in Jerusalem. The church was in use until 1705, when a replacement was built nearby. It was then used as a storage shed until 1756 when much of it was dismantled for stone to repair the new church. Another church was built around it in the nineteenth century. Neither of the later two churches survive. Orphir is mentioned several times in the Orkneyingen Saga, which is well worth reading. It is related as the site of the bizarre accidental murder of Earl Harold Haakonsson in 1130. One morning he came upon his mother Helga and Aunt Frakokk making a magnificent white garment. Ignoring their entreaties, he put it on and died. It had been intended for his co-Earl brother Paul. Both Harold and Paul were sons of Haakon who had killed Magnus Erlendsson (and who later became St Magnus). 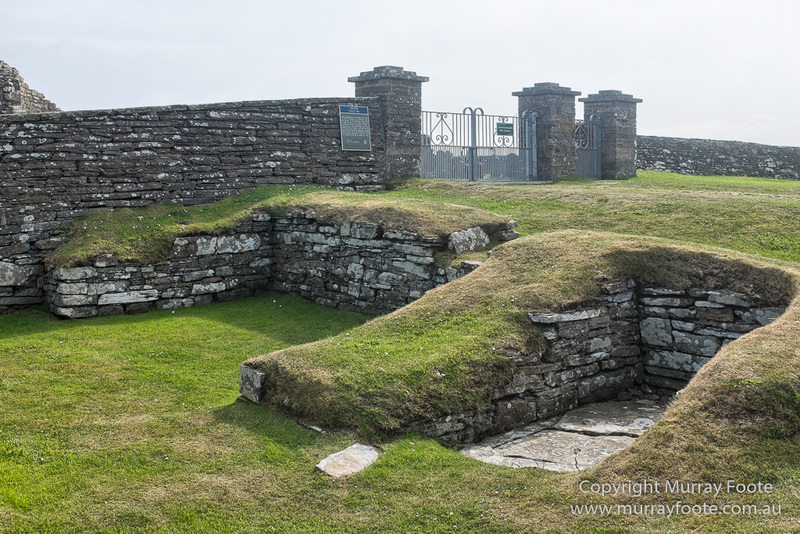 The Earl’s Bu was the site of another murder outlined in the Orkneyingen Saga. The remains of the Bu suggest one long building 15 x 6 metres, or two conjoined buildings with several internal divisions. The walls and roof would have been covered in turf and there would have been no windows. We see the remains above. The entrance was said to be “a few steps from the church”. We can see what may be the entrance up against the wall which must date from the eighteenth or nineteenth centuries. The wall is more than two or three steps from the church so perhaps the building continued beyond it. No excavation is possible beyond the wall because the graveyard is still active. In Christmas 1136, Svein Breast-Rope and Svein Alseifarson were amongst the people drinking around the table in the hall. Svein Breast-Rope repeatedly complained that he was in various ways receiving more alcohol than the other Svein (it was evidently something of a drinking competition). Then he was heard muttering under his breath “Svein will kill Svein” which was taken as a threat. Consequently Svein Asleifarson hid behind the door and hit him with an axe. Svein Breast-Rope did not initially fall but after staggering he struck back – killing not Svein A but his relative Jon. 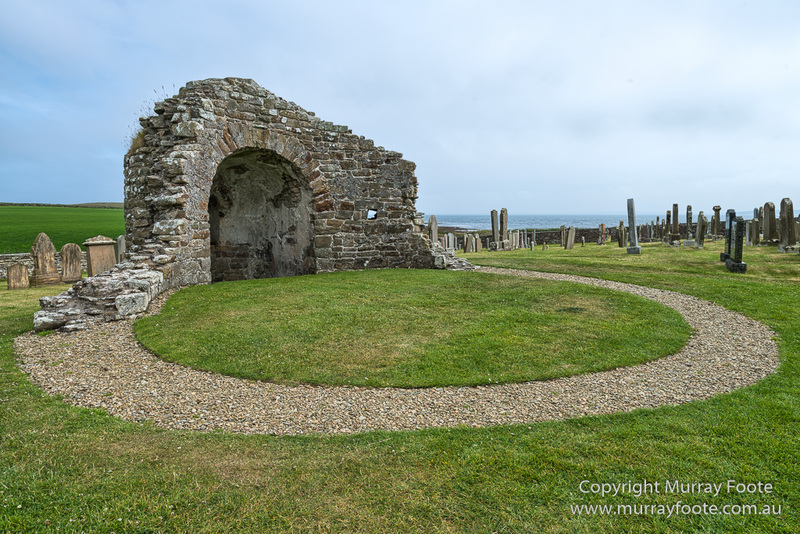 In 1156 there was conflict between the then three Earls of Orkney. The three were Rognvald Kali Kolsson (who vanquished Paul Haakonsson and built St Magnus’ Cathedral), Harald Maddadsson (grandson of Haakon Paulsson who had killed Magnus Erlendson or St Magnus) and Erlend Haraldsson (son of Harold Haakonsson, who had died accidentally by donning the poisoned clothing). Erlend launched a surprise attack on Orphir, and Rognvald and Harald escaped only narrowly and fled to the Scottish mainland. 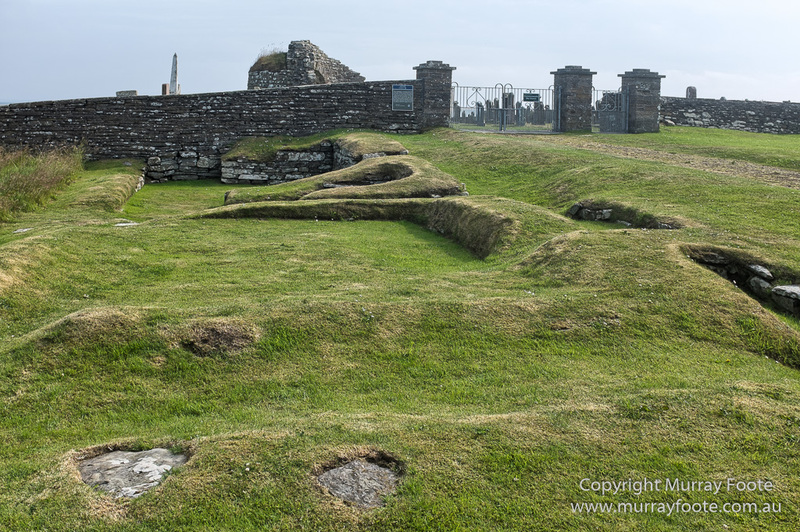 A few months later, Rognvald and Harald succeeded in killing Erlend in another surprise attack, this time at the Island of Damsay on the other side of Mainland in Orkney. 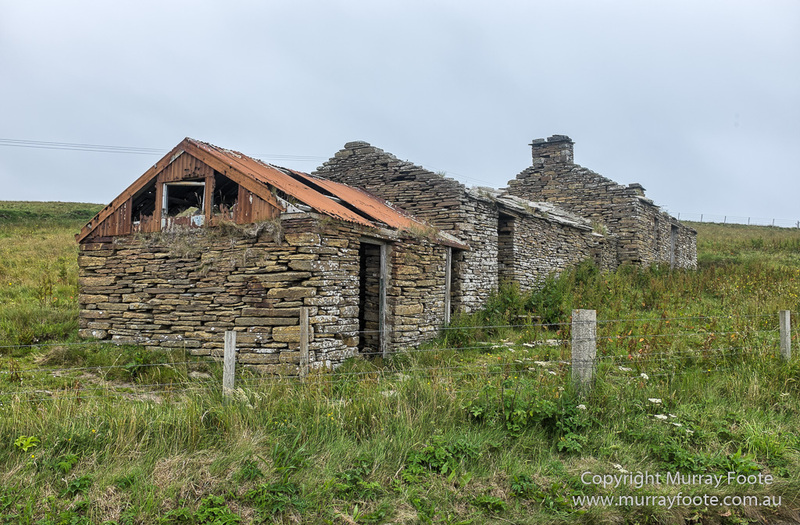 Just across the road, these are some abandoned farm houses of much more recent vintage than Viking times. 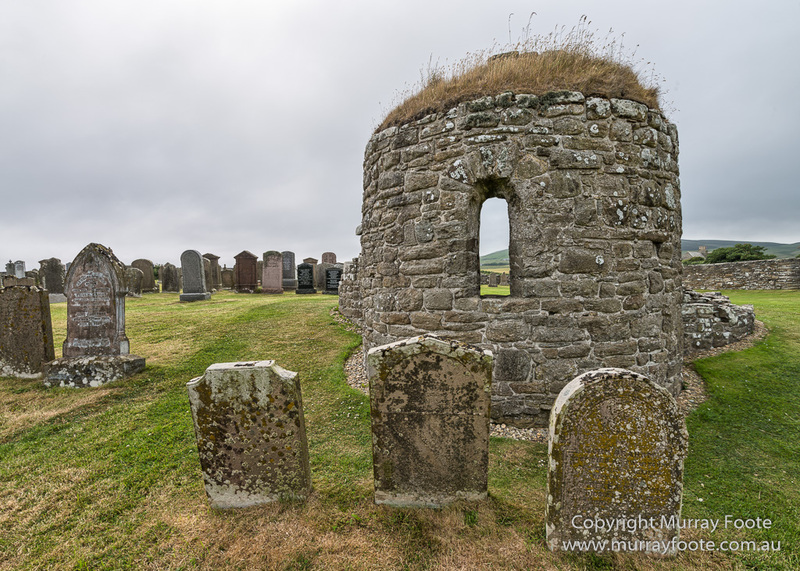 This entry was posted in Orkney, Scotland and tagged Archaeology, Architecture, Earl's Bu at Orphir, History, Landscape, Orkney, Orkneyingen Saga, Orphir, Photography, Round Church of Orphir, Scotland, Travel.